When I started working remotely from home, I was really happy. I was happy for several reasons, number one being the fact that now I could do work while sitting on my lounge couch. It was like a dream come true, to be honest. But soon enough I realized that it is not possible. I wasn't progressing, my work was slow, and I slacked all the time. The work I used to get done at my office in fifteen minutes started taking a couple of hours because I would start watching a YouTube video which would lead to a marathon of YouTube videos. And then I decided that I have had enough! The situation was getting out of control, but I soon decided that I have to do something about this. I still didn't like being chained to a desk but to boost my productivity, I needed a schedule. To begin with, I started timing my work. I designated hours to works, and I would religiously sit and work for the designated time. Even then, I could not track significant progress in my work. And that was when I realized that it is probably time to go back to the office. No, you guys, I did not join the same old, boring job. I set up a home office for myself. I chose this nook of my library that has a window staring out in my courtyard and created a mini office segregated from the rest of the library. (My kids use the library for studying, so I couldn't take up all of it) Since that day I have noticed significant improvements in my work pattern. I have been more productive than I was, even at my nine-to-five job and I figured that I needed less time to get the job done. Now when I write about it after years and years, I have learned the importance of a home office, and I can help you with setting up yours. So let's talk about the accessories that you are going to adorn your office with when you set up one. 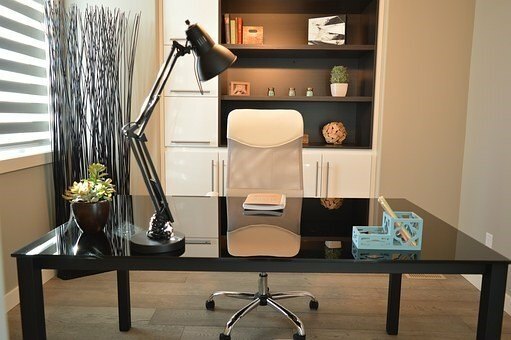 Your home office ought to have the perfect chair for you. You’re going to sit at it for hours while you work and we do not want a stiff back! Try to find a chair that is ergonomically friendly. Don't opt for cheaper options, they'll wear out quicker, and they won't provide you with any comfort. And you don't have to spend hundreds of dollar for it; you can find the right chair at the optimum price if you look for it carefully. Watch out for the best deals on eBay by certified sellers, which should be helpful. Your other prime needs as far as office accessories are concerned a desk. Consider buying a desk that is ergonomically friendly. The best option that you have got is a good adjustable standing desk. Working while standing is becoming the new trend these days! It saves your lunch from just sitting in your stomach, never getting digested. These desks allow you to adjust their height according to yours and this characteristic provides you with the opportunity of working either while standing or sitting. Even when you're sitting, it can be adjusted to your height which is a great comfort. You’re going to need a lot of them! You see, depending on your type of work you would need a variety of storage spaces. First, you have to identify what your needs are. If you have a lot of paperwork at hand, you have to get a filing cabinet and filing tools to keep it all organized; you cannot just throw it at your desk and call it a day! If you don't want the shelves to take up all the space, invest in a hanging filing system. You would probably think if you're working from home you wouldn't need to take care of decorating your space. But you have to decorate it exactly like you would decorate your office if it weren't at home because we're looking to recreate the atmosphere here instead of merging it with the home. Hang a few family photos around, add some pretty stationery if you like (I love cute stationery!) add all those little elements that would make the space pop up and look attractive. The last thing that I want to tell you about home offices is that unlike your workplace, this office doesn't get a janitor. You will have to keep it primed and proper. Clean it on a regular basis and keep it aesthetically pleasing. Just like you would frown at your office if it weren't cleaned up on your previous job, you have to keep your private and homely workplace clean as well. I hope you get a knack of what it takes to build an epic home office that you would feel proud to sit in, now go on, start setting it up and discover your true work potential while working in a personally tailored workstation! Good luck!